Sorry for the lack of a wine article yesterday. 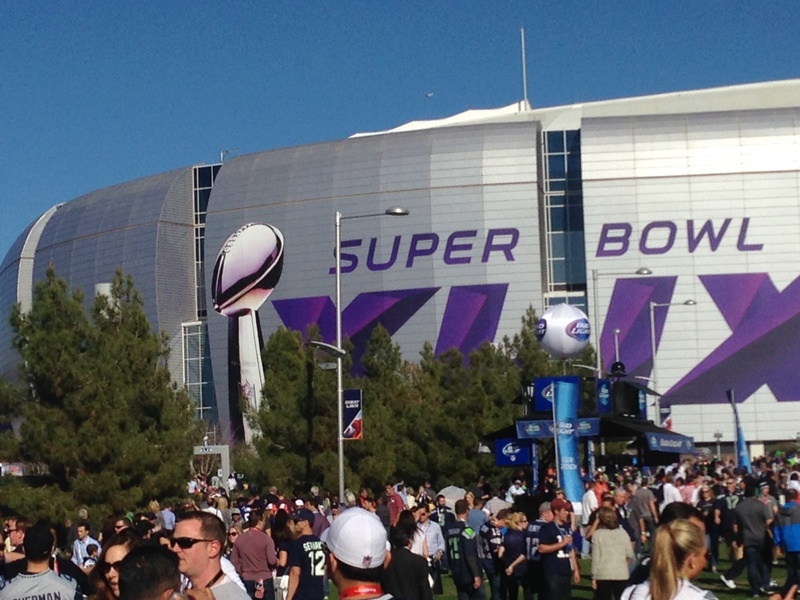 We just got back from Arizona and I wanted to share the pictures in case any of you or your significant others have Super Bowl on the bucket list. The trip started off sunny the first day, but then it rained for the next three days. Our hotel placed sandbags in front of our cottage to ward off any flooding. 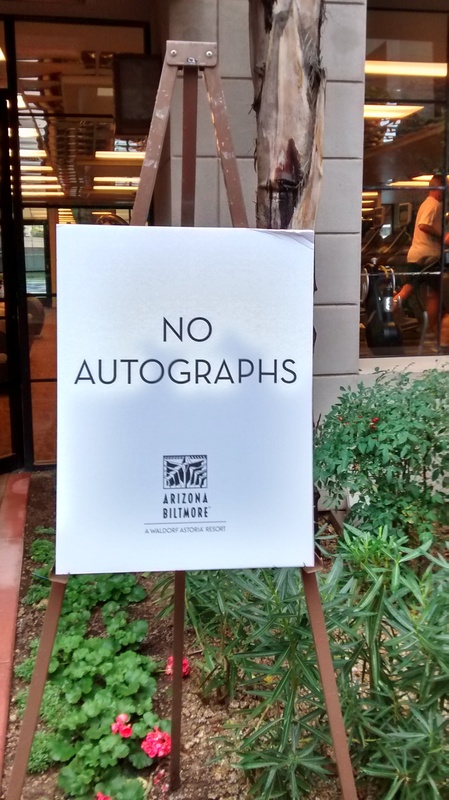 A sign posted outside the workout room at our hotel. There were no exciting stars to be found…only guys young and old who didn’t appear to use the gym enough. 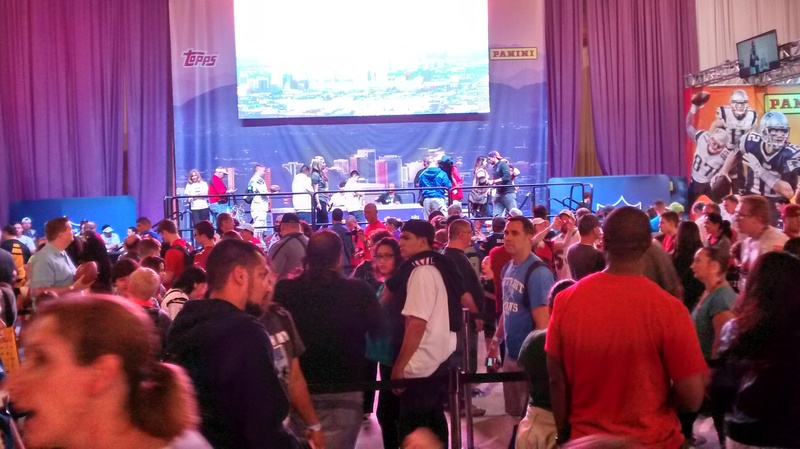 On Friday afternoon my husband and I went to NFL Experience in downtown Phoenix. 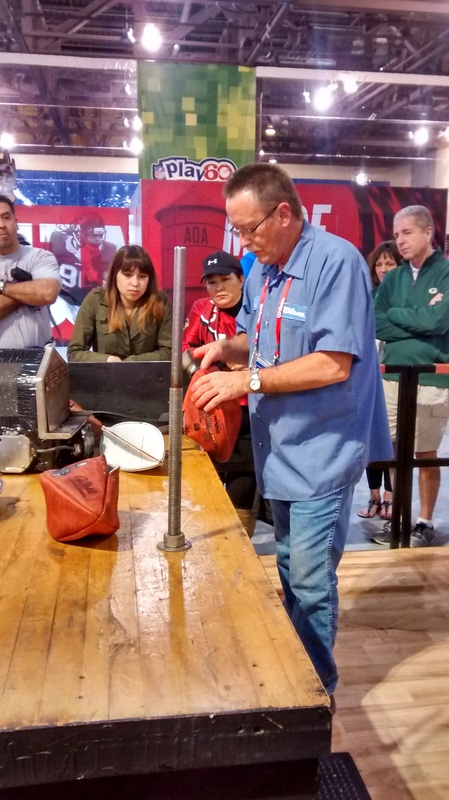 This is the perfect place for families and fans to get their fill of all things football. They had an autograph section sponsored by Topps. 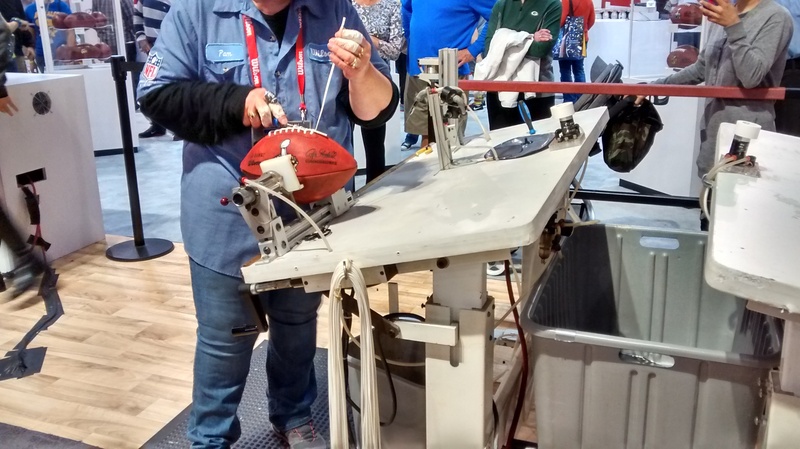 Wilson (the official ball for the NFL) sold footballs made by hand right in front you. 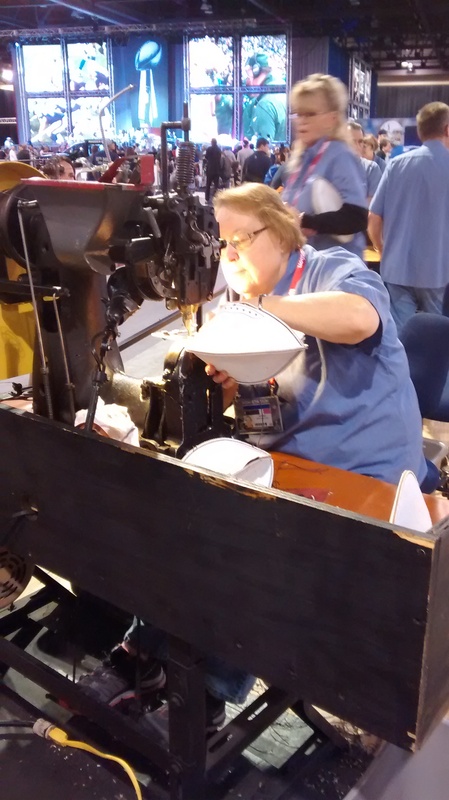 They start off by sewing the football. Next they steam it in that black box above to soften the leather. Then they place it on a metal rod to turn it inside out. This is probably the toughest part. My husband has seen huge football players try to turn the ball out and they struggled big time. The ball is then passed along to the woman who adds the laces. 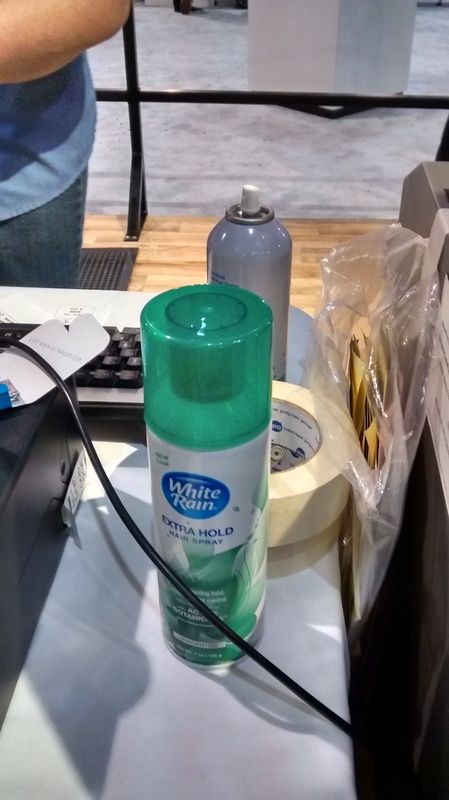 Finally, they add your name and douse it with their secret spray to keep the letters from smudging. There you have it. This whole process is truly and unfortunately, a dying craft. 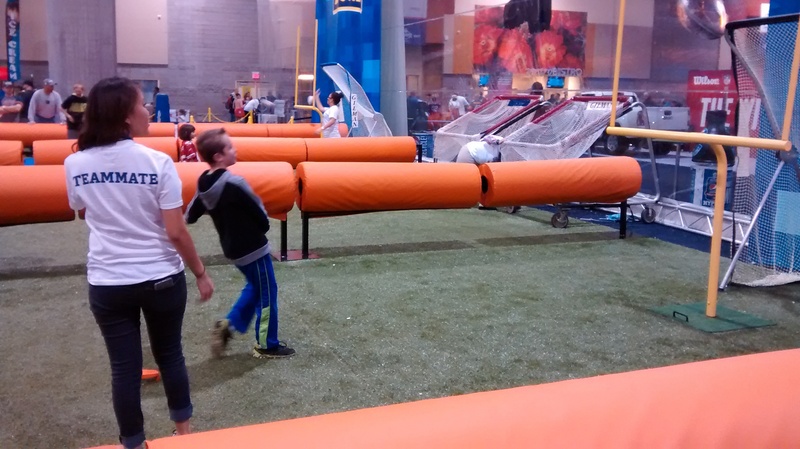 Moving on to the kids area – they offered areas for wind sprints as well as kicking and tossing the football around. 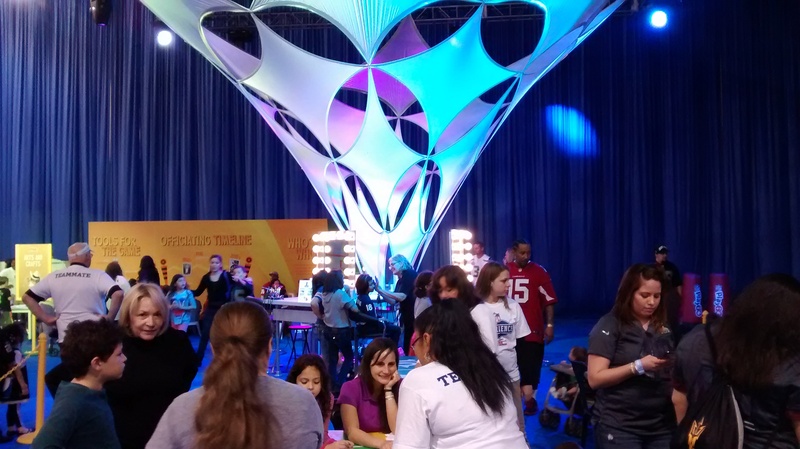 There was a craft area for children to color their own t-shirts or get a Super Bowl or NFL logo airbrushed on their cheek. 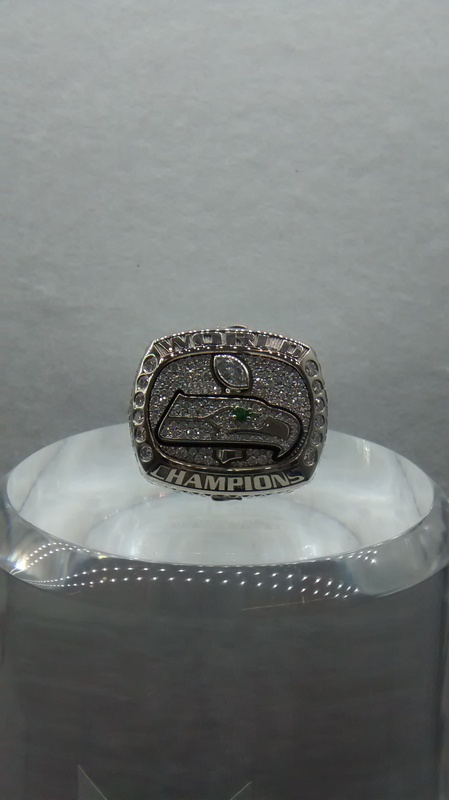 If diamonds and other gemstones make your heart all aflutter, then check out the Super Bowl rings of the past. The video they played while standing in line portrayed the ONLY time you will ever see a grown man swoon over a piece of jewelry. 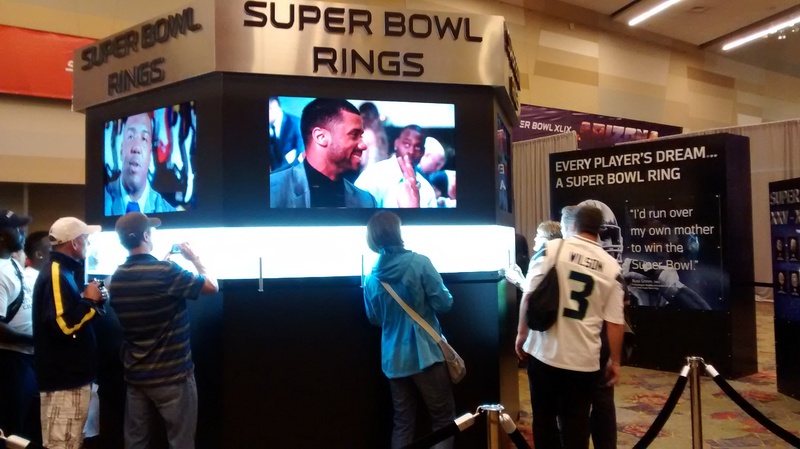 Tiffany and Co. creates all the rings for the Super Bowl champions. 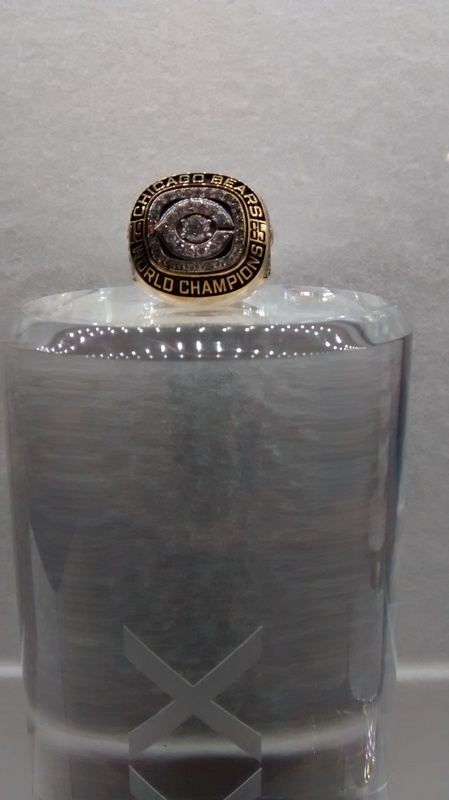 Here is the first ring ever made. So simple, right? Da’ Bears! 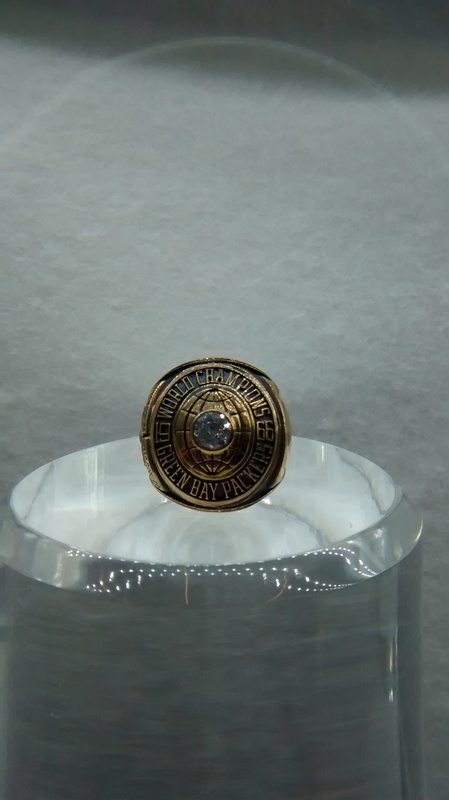 Engraved on each ring is the team, year and player’s name. Comparing the most recent game ring back to the first one; that’s a lot of bling. We could have spent many more hours at The Experience, but it was getting late and we needed to grab something other than nachos and a hot dog for dinner. 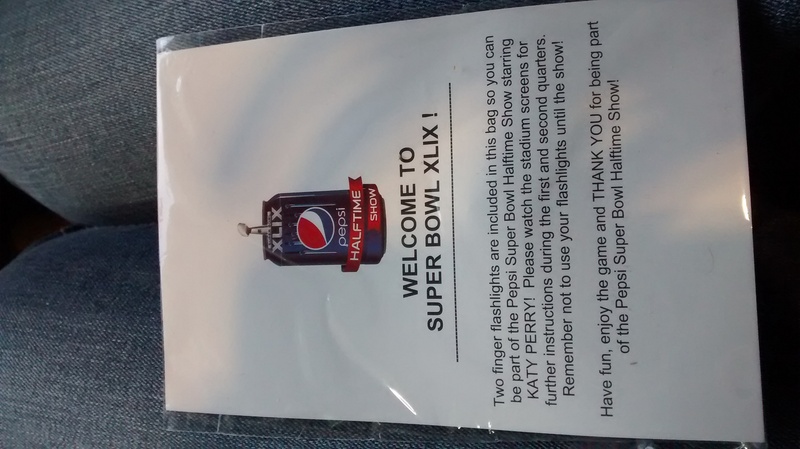 I would highly recommend attending The NFL Experience when/if you make it to the Super Bowl. 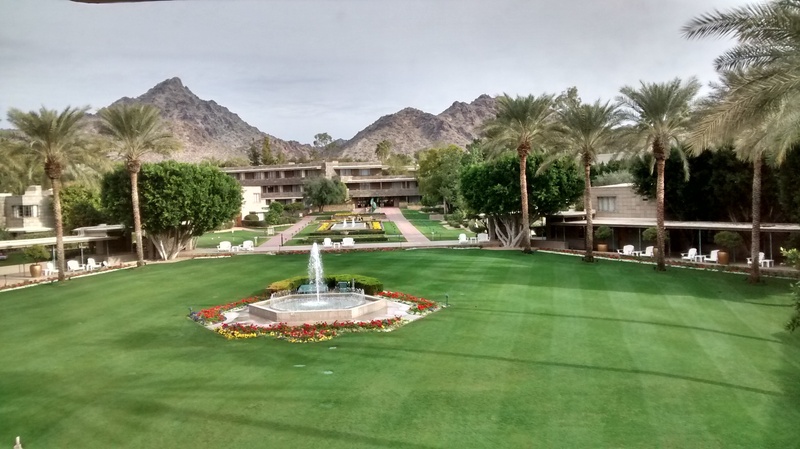 The cost is $20-$35/person and there is so much to see and do that I barely scratched the surface. 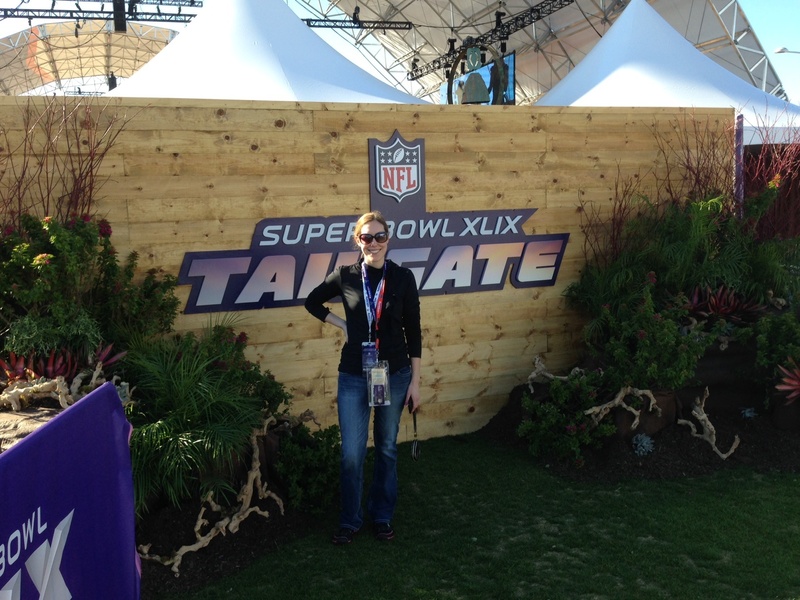 Another experience other than the game that I would strongly encourage is the Tailgate Party. This gives you a hassle-free entry to the game and allows you to sample and people watch to your heart’s content. Ignore the awful tags hanging from my neck and gym shoes. I go for comfort all the way on game day. Sure you can wear heels, but they would be sinking into the grass, mud and other unknown gunk you walk through. Keep in mind that it is mostly guys that surround you and they can be, well, guys/gross/unhygienic/wasted. Oh, and no purses or bags allowed unless they are clear or small like a wristlet. Dierks Bentley and Gavin McGraw played while guests mingled/ogled. Interesting costumes above the bar that served amazing Bloody Marys. 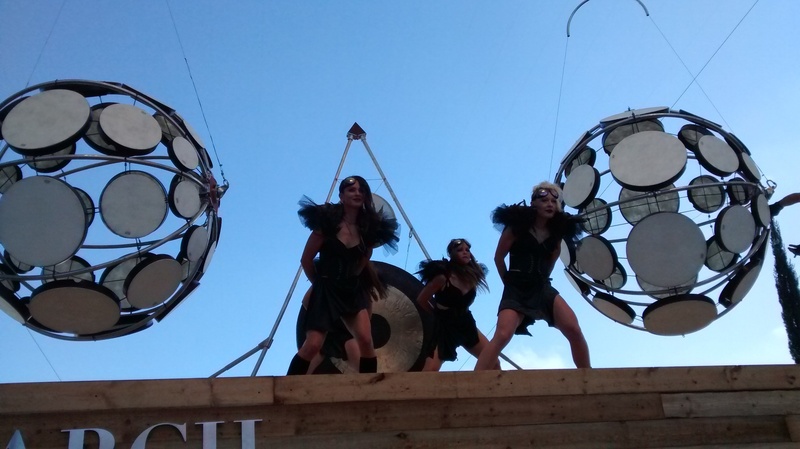 Those three-dimensional round things are drums. We sampled the steak tacos, guacamole with pumpkin seeds and for dessert, vanilla cream sorbet with a hint of cinnamon. 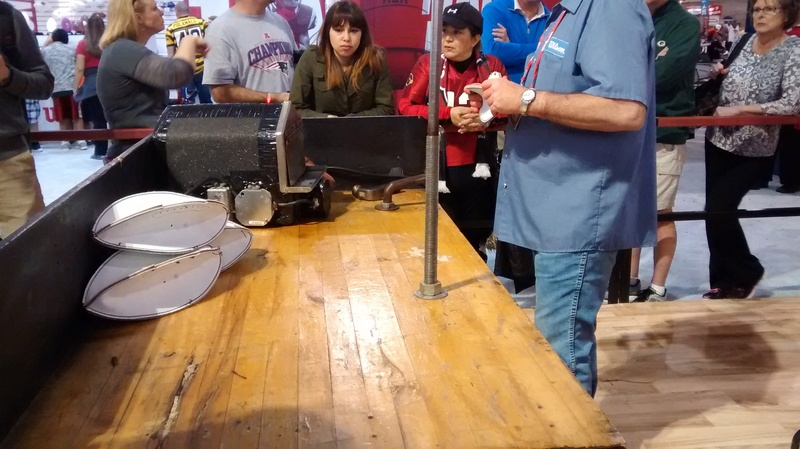 This was not your typical tailgate fare. They also had a dozen or so different kinds of chilis for the chili cookoff, Mahi Mahi tacos, cowboy salad (corn, rice, beans and lots of spices) and plenty of other desserts. You will not leave the party hungry. Before we knew it, it was time to head into the game. 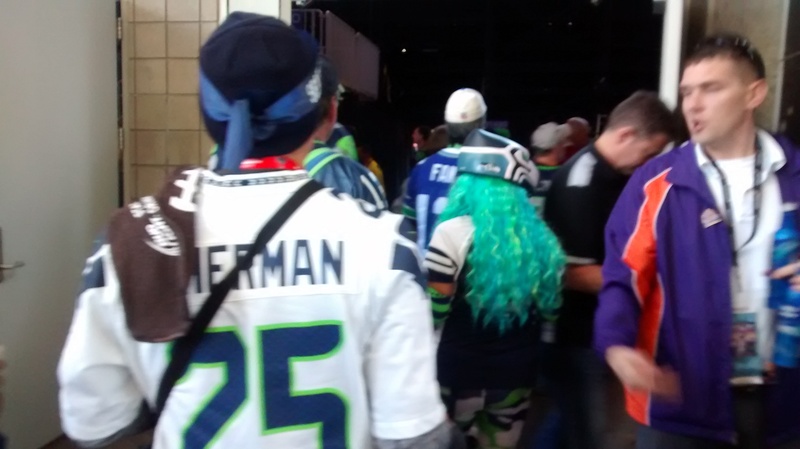 Seahawk fans won for most outrageous team spirit. Many donned outfits that were colorful and memorable. 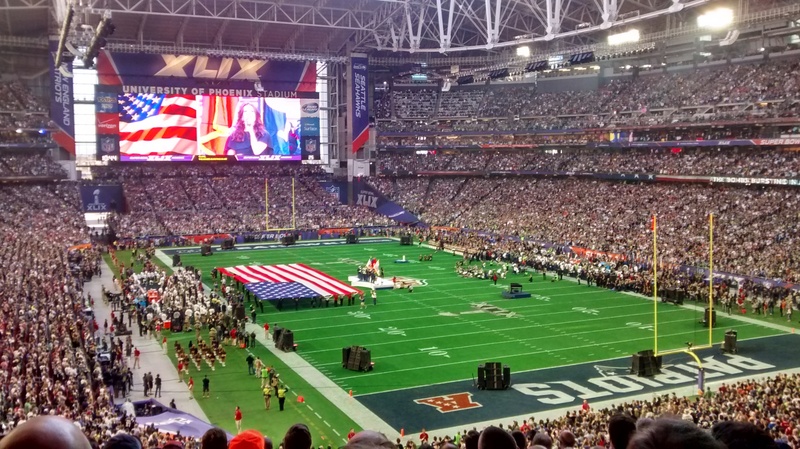 This picture and the entire Super Bowl encapsulate what it means to be an American. When the jets flew overhead you couldn’t help, but get a little choked up. I also couldn’t get a mental picture of Elsa singing the National Anthem out of my head. Thank you Frozen. 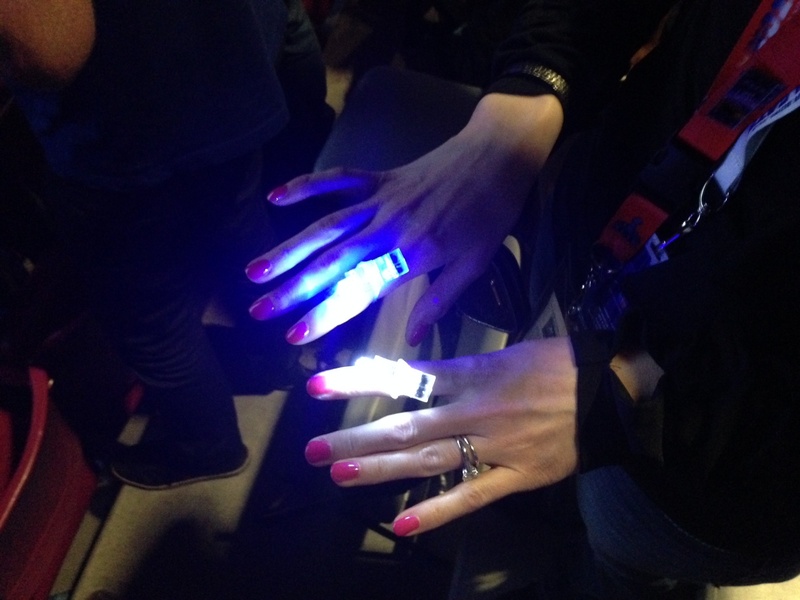 For the Halftime show they gave us these nifty little finger lights. Instructions were included for those who were sober enough to read them. 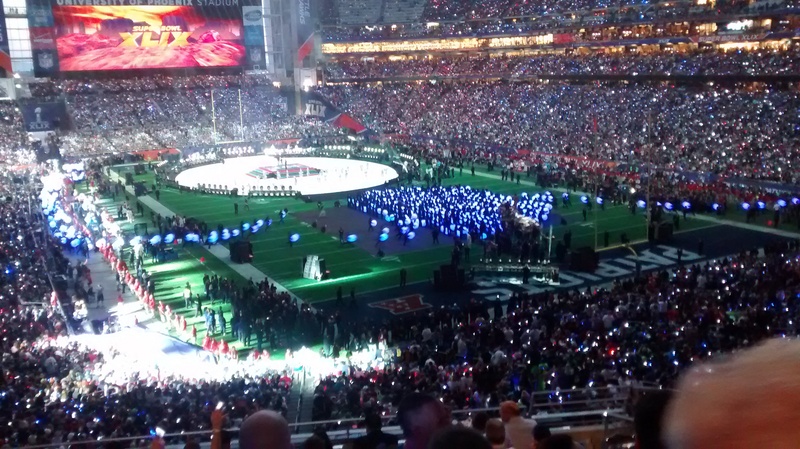 Start of the Halftime show. 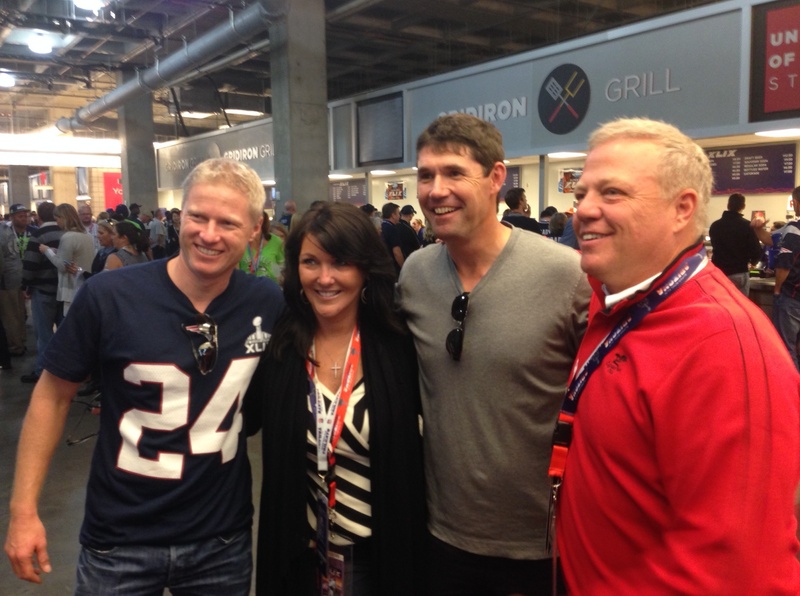 After the show some of my husband’s co-workers ran into pro golfer, Padraig Harrington. Storming the field. 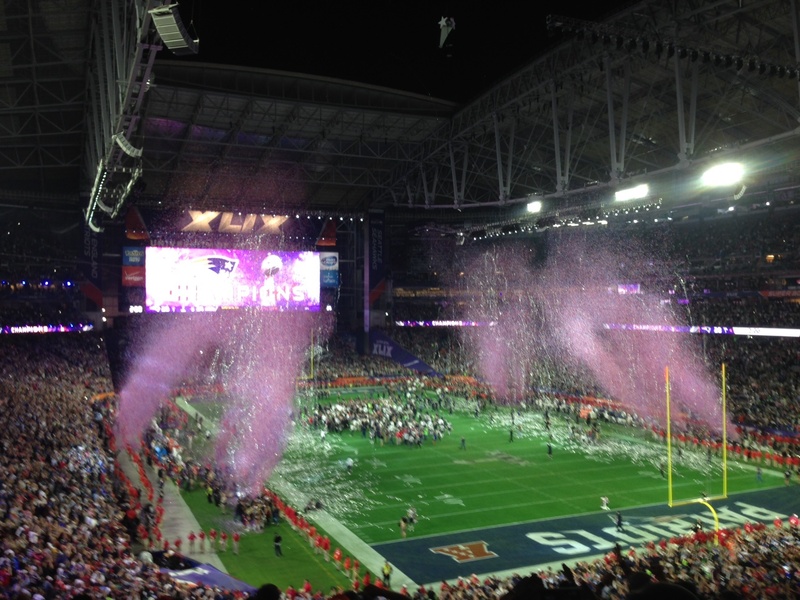 By far, the best Super Bowl yet with some gutsy game plays and a close score the entire time. Even if you are not a huge fan of the game or for the teams involved, this is one event that is worth witnessing at least once in your lifetime.